Northants have further strengthened their playing squad with the signing of Luke Procter from Lancashire. The 29-year-old has signed a three-year deal at Wantage Road, and says he is looking forward to ‘starting the next chapter’ of his career with Northants in the summer of 2018. Procter knows exactly what he is walking into by joining the County, as he spent a spell on loan at Wantage Road at the back end of last summer, and he said: “I’m really excited to have the opportunity to play for a club like Northamptonshire. “They really impressed me at the end of last season whilst I was on loan and the lads have made me feel really welcome and part of the team. “I’m eager to impress moving forward so I’m excited to join up with them all this winter, put in some hard work and begin the next chapter of my career. Oldham-born Procter joins from Lancashire, where he has spent the entirety of his career having graduated from the club’s Academy. A left-hand batsman and right arm seam bowler, Procter earned his first professional contract at Old Trafford in 2010 and made his mark during that memorable summer for the Red Rose – not least with a knock of 89 against Sussex, which included five sixes off former Northants and England spinner Monty Panesar. Procter brings with him the experience of playing in a Championship-winning side, and he topped the batting averages for Lancashire when they claimed the title in 2011. That was the season after making the first of his 66 first-class appearances for the club. 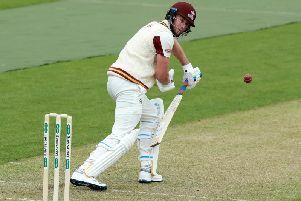 Procter enjoyed the most prolific season of his career in 2016, scoring 822 runs with a career-best 137 against Hampshire, but he found opportunities limited last season and joined Northants on loan. He shone with 82 and 94 in the County’s final Championship match against Leicestershire at Grace Road, and has now signed for Northants to open a fresh chapter in his career. County head coach David Ripley is delighted to have acquired the services of a player who has a proven track record, and also has more than one string to his bow. “We really wanted to sign a batter that can bat time and build partnerships in red ball cricket,” said Ripley. “Luke showed in his time with us at the end of the season that he can do that job, averaging 58 and making three 50s. “I am delighted he is joining us, he could have stayed in the squad at Lancashire, but he is hungry to play more cricket and is willing to move to get the opportunity. “He is a more than handy fourth seamer too, and his arrival will really sharpen the competition in the squad for starting places. In all, Procter has scored 3,105 runs in his first-class career, at an average of 31.68, scoring three centuries and 17 half-centuries. With the ball he has also produced some good performances, claiming 75 wickets in all at 35.81, with best bowling figures of seven for 71. While with Lancashire, Procter also played a fair bit of one day and T20 cricket, with a top score in List A matches of 97, and a top T20 score of 25 not out, although perhaps more importantly his career strike-rate in the shortest form of the game is 96.06.